Osler Bluff Ski Club | Williamson Williamson Inc. The Osler Bluff Ski Club operates a large property in Southern Ontario facing north to Georgian Bay that encompasses not only the trails, clubhouses, and support structures, but also a number of cottage ‘villages’ and retention ponds. For generations, the various lodges and clubhouses have been well-loved and well-used by the membership. These buildings are an important part of club memories and the club’s future, but their use has changed over the years. As high capacity high-speed chair lifts were installed, taking skiers faster uphill and advances in ski equipment allow members to ski more quickly downhill, instead of skiing ten runs or more a day, now you can ski ten runs in an hour. This translates into more family and social time moving off-hill. More than a needs assessment document, the Master Plan become a comprehensive roadmap to guide the Osler Bluff Ski Club into the future and to provide prudent management of not only this significant real estate asset, but the ephemeral qualities that make up the culture at Osler. The Primary Goals of the document were to create a phased development and renovation plan that will continue to promote the values of OBSC, to enable OBSC to ensure its position as the premier ski club in the region and to meet the growing needs of OBSC constituents. It is a visionary growth and efficiency plan, consistent with the financial goals and changing demographic needs of the club. The process began with rigorous research, speaking to members of the club and visiting Osler on its busiest days. Later, a full membership survey, interviews with staff and administration, and an in-depth facility assessment were critical in understanding how the operations interface with and affect the membership experience, and how the various component user types aligned or conflicted in scheduling and spacing patterns. Early on, we are able to judge not only the relative size and scope of key uses but their required adjacencies. This programmatic visualization of the weighting of uses offered a baseline to critically integrate growth solutions, sequencing and scheduling. By understanding each structure across various user groups, we discovered overlaps as well as spatial opportunities. This early mapping helped portray a larger framework from which to identify potential spatial conflicts or openings. The resultant Master Plan describes a series of incremental, strategic investments in its built assets that will complement Osler’s existing resources in order to provide substantive value to the members. By doing so, the Club seeks to maintain its position as the premier ski club in the region and will continue to build upon its legacy. The first project stemming from the Master Plan work is an addition and extensive renovation of the Main Clubhouse. 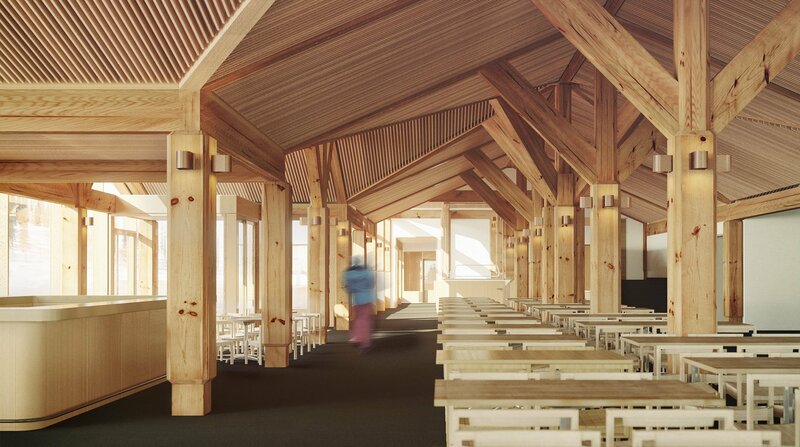 The original structure, built in 1974 of core slab and heavy timber, required significant health and life-safety upgrades as well as simply more tables and bar space for the members. 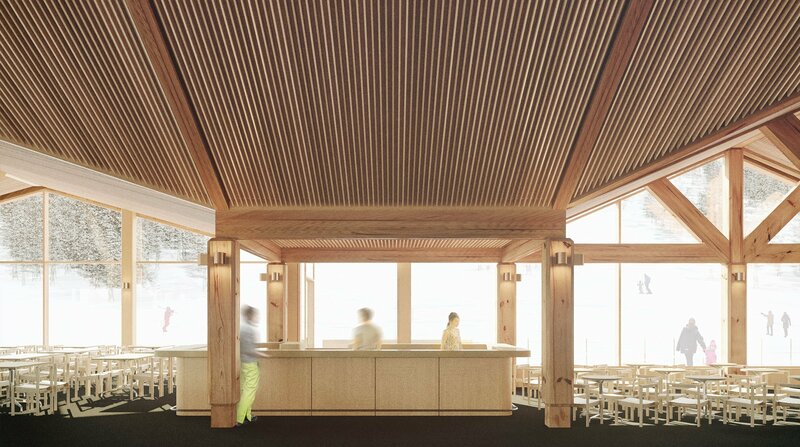 The gabled roof was continued and coupled with a new modern expression of wood detailing in the new columns and ceiling. Construction began on March 19th, 2018 and will be completed in a single green season, allowing members to get back on their skis in early December.